The island object is a generic class that simply adds padding to an element. The nav abstraction is another generic class that will turn a bulleted list into a horizontal navigation menu. Additionally, if you use the fluid grid system builder available on the inuit.css website, creating a grid-based layout is a piece of cake. I’m going to walk you through how to do exactly that. Step 1: Download inuit.css from the inuit.css website. You can do this by clicking on the big “Download now” button on the right side of the page. Extract the zip archive, then get the inuit.css file from the core/css folder and include it in your document. Other include statements can be added to this file as well to add other igloos to your document, but leave it the way it is for now. By keeping the grid.inuit.css file separate from the rest of the inuit.css framework, along with any other igloos (or plugins) we want to add, we are making it easy to change the grid later should the need arise. For the purpose of this article, I’ll assume you’re using a grid that is composed of 12 columns. Step 3: Apply a class of .wrapper to the body element in your document. Step 4: Create a div element within the body element of your document. Apply a class of .grids to the div element you just created. The grids all come with preset widths and therefore their box model properties should not be edited or overridden. If you would like a <div> with a yellow background and a padding of 10px then create a <div> inside a grid container and style that. That wraps up my discussion on inuit.css. There are lots more ways it can be used to create great looking websites, so head over to the inuit.css website to check it out for yourself, and be sure to let me know if you found this article helpful! 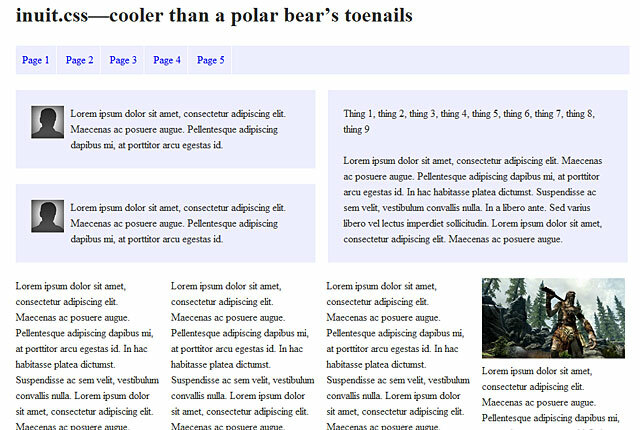 This entry was posted in CSS, CSS frameworks, Grid systems, inuit.css, Responsive design, Web design on January 17, 2012 by Dave. How does the Dropdown work? I dont get it =/ hover is over the parent menu. The markup above is included in the dropdown.inuit.css file as a comment. You can follow the same basic procedure for using other igloos. Yes indeed I mean the igloo. I copied the markup into the demo index.html and included the dropdown.inuit.css but its still wrong. “About us and The board” is still over “About”. I tried it in different browsers but nothing. Also, make sure your document can find the inuit.css file. When I opened the demo/index.html file, it was referencing the inuit.css file in “../core/css,” which wasn’t available to my document. Hello Dave, thanks for the article. I wanted to know why classes are use extensively and not id’s? Is the fact that it needs to be a class when re-sizing as the element ‘header’ needs to be re-referenced? … you should think of grids as a set of shelves; they literally only hold things and are not styled themselves. This brings the benefit of fluidity to your builds; if your grid constrains the widths of objects then the objects themselves can be fluid, meaning you could move a promo from inside a .grid-4 parent into a .grid-6 parent and it will always occupy the available space. Seven columns across the top row. The middle row is one column. The bottom row is five columns. Hey! Thanks so much for this tutorial! I’m new to grids and been struggling to figure it out, but you just helped make it a lot more sense! Glad I could help :D inuit.css is a great one to start with. If you like Inuit, consider trying Cascade Framework ( http://www.cascade-framework.com/ ). It’s based on a similar architecture, but it’s easier to use, more flexible, etc. I don’t mind a little self-promotion, but please explain what you find easier to use about it so as to actually contribute to the discussion. * Inuit has only very little official documentation. For some decent demos, you need to rely on external sources like http://terabytenz.github.io/inuit.css-kitchensink/ . * Inuit requires heavy custom styling to be useful for anything. Cascade Framework has a production ready default color scheme and typography similar to Bootstrap. Unlike Bootstrap, however, this color scheme and typography is optional. If you fully custom styling, you can get rid of all the fat. * Cascade Framework’s grid is largely based on Stubbornella’s highly flexible grid system, but adds even more flexibility. You can use both semantic and presentational techniques or combine both. * Cascade Framework has advanced UI components like panels and shared components (eg. nav) are more generic in Cascade Framework. * Cascade Framework does not use BEM, because BEM restricts the cascade which effectively neuters ones of the most useful features of CSS… and also leads to extra bloat. * The recommended versions of Cascade Framework are only 3.5Kb and 4Kb after minification and Gzip… or 11.5Kb and 14.5Kb without Gzip. * Inuit requires IE8 or higher. 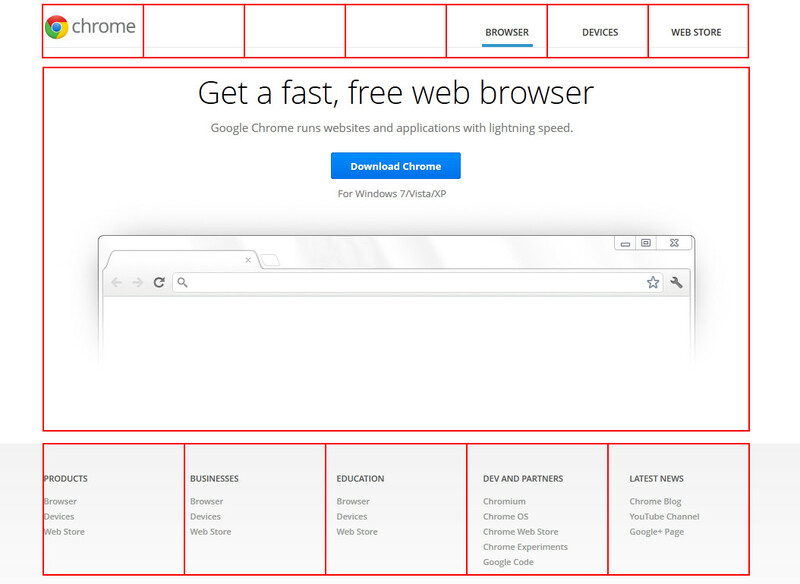 Cascade Framework also support IE6-7. Note that Cascade Framework 2 will be SCSS-based and will integrate Cascade Framework with Cascade Framework Light. It is currently in development. That is pretty cool! I will have to look into it some time.